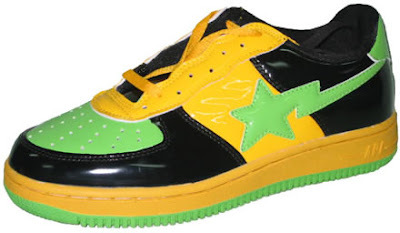 The super duper fake Bathing Ape sneakers that came in more styles and colors than the designer ever made. Or the extra ignorant designer print Air Force Ones (in faux, Gucci, Burberry, or Louis Vuitton...and if you really wanted to throw off the general public, Fendi). Bonus: I'll give somebody $5 if they admit they had a pair of either shoe.